On the ferry to the park, visitors can enjoy open skies and the sights and sounds of the harbor. 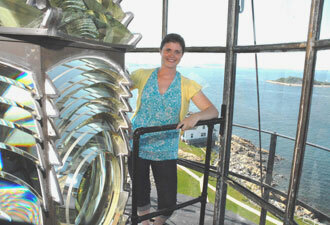 Taking an up-close look at the second-order Fresnel lens of Boston Light on Little Brewster Island. Imagine a place where you can explore tide pools, walk through a Civil War-era fort, climb a lighthouse, hike lush trails and salt marshes, camp under the stars, or relax while fishing, picnicking, or swimming ... all within reach of downtown Boston. What better place to start than the official gateway to Boston Harbor Islands? Underneath the wavelike canopies of the Boston Harbor Islands Pavilion, you'll be welcomed by a park ranger. You'll also have the opportunity to learn about the park's natural and historic resources, purchase ferry tickets, and shop at the park store. If you can't make it to the pavilion, check the park ferry schedule to plan your trip. Just choose your island. Spectacle Island is a great destination for those who want to whisk themselves away from life in the city to an island venue. Kick back, relax, and enjoy the visitor center. Chill to the sound of jazz on Sundays, or take a swim, go hiking, or participate in other outdoor activities that get you moving. 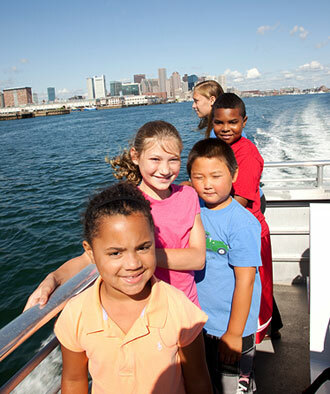 Accessible and just minutes away from downtown Boston, it is an easy and enjoyable trip for all ages. Find yourself wanting more? One of the best-kept secrets in Boston is the salt marsh tour and inter-island connection on Sundays between Spectacle Island and Thompson Island. Georges Island is a favorite of adults and kids. Be sure to stop by the new visitor center, pick up a map, and check out the exhibits. Explore the tunnels and rooms of Fort Warren, a Civil War-era prison, and transport yourself back in time. Take part in one of the commemorative events planned for the 150th anniversary of the Civil War or one of the many other program offerings. Are you an avid camper without a car? The camping islands (Bumpkin, Grape, Lovells, and Peddocks) are all accessible by public transportation from Boston. Campers with cars find it easy to park at Hingham Shipyard and catch the ferry from there. You can find helpful tips and reservation links on the go camping page. Looking for more adventure? The Boston Light Tour was dubbed “The Ultimate Lighthouse Experience” by The Boston Globe. 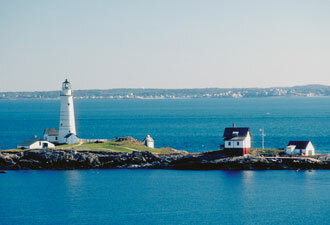 Little Brewster Island, home to Boston Light, provides a unique experience and spectacular views. Climb the 76 stairs and two ladders to reach the top! There is no shortage of things to do on the islands of Boston Harbor. Check the the park calendar for up-to-date information on events. Boston Harbor Islands is managed by a unique, 13-member partnership, which includes the National Park Service and other public and non-profit organizations. An advisory council provides a formal mechanism for public involvement.